Self-contained NEX QC⁺ with built-in printer. For more demanding applications, or for situations where analysis time or sample throughput is critical, Rigaku offers the new NEX QC⁺ spectrometer. Employing the next generation silicon detector technology, the enhanced NEX QC⁺ affords significant improvement in elemental peak resolution and counting statistics, resulting in superior calibrations and measurement precision for the most challenging measurements. 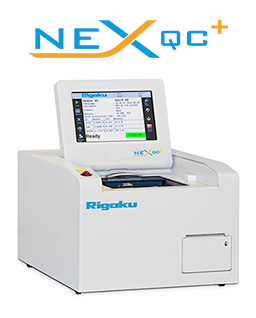 Specifically designed for routine quality control applications, the new Rigaku NEX QC⁺ features an intuitive "icon-driven" touch screen interface for easy operation and a built-in printer for convenience. The shuttered 50 kV X-ray tube and Peltier cooled semiconductor detector deliver exceptional short-term repeatability and long-term reproducibility with excellent element peak resolution. This high voltage capability (50 kV), along with multiple automated X-ray tube filters, provides a wide range of applications versatility and low limits-of-detection (LOD). 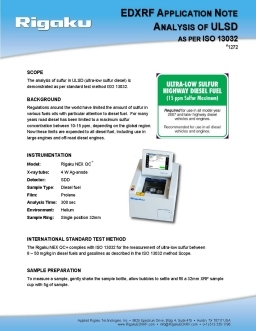 The analysis of sulfur in ULSD (ultra-low sulfur diesel) is demonstrated as per standard test method ISO 13032. Regulations around the world have limited the amount of sulfur in various fuels oils with particular attention to diesel fuel. For many years road diesel has been limited to a maximum sulfur concentration between 10-15 ppm, depending on the global region. Now these limits are expanded to all diesel fuel, including use in large engines and off-road diesel engines. 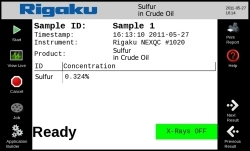 The results shown here indicate the Rigaku NEX QC⁺ EDXRF analyzer gives excellent performance for the measurement of ULSD as per standard test method ISO 13032. The versatility of the NEX QC⁺ also make it an ideal tool for the measurement of many other elements and oil matrices as well, such as lube oils, wear metals in oils, used oil and waste oil, and other elemental analysis needs throughout the petroleum industry. The measurement of Pt, Rh and Pd in recycled automotive catalytic converters is demonstrated using the Fundamental Parameters (FP) approach. Used catalytic converters are collected and recycled in order to reclaim the precious metals Pt, Rh and Pd. Typically, the entire honeycomb core is removed and ground into fine powder. Once in powder form, the precious metal catalysts can be extracted, or the powder can be sold to a refiner. The honeycomb core is typically ceramic, containing combinations of the elements Al, Si, Fe, Zn, Sr, Zr, Ba, La and Ce. Some cores can be made of a stainless steel honeycomb and so would contain higher Fe and other metals. Catalyst material may also be high in Pb content, in regions where leaded gasoline is still used. Because all of these matrix elements can occur at various levels, the fundamental parameters software with matching Library offers quick direct analysis, of powdered catalytic converter cores, without the need for a large suite of calibration standards. 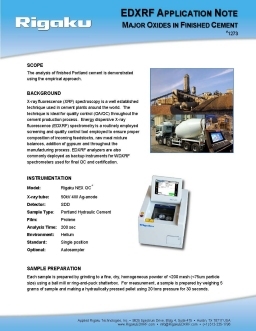 The analysis of finished Portland cement is demonstrated using the empirical approach.X-ray fluorescence (XRF) spectroscopy is a well established technique used in cement plants around the world. 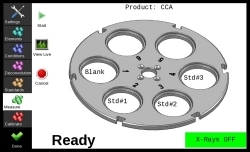 The technique is ideal for quality control (QA/QC) throughout the cement production process. Energy dispersive X-ray fluorescence (EDXRF) spectrometry is a routinely employed screening and quality control tool employed to ensure proper composition of incoming feedstocks, raw meal mixture balances, addition of gypsum and throughout the manufacturing process. EDXRF analyzers are also commonly deployed as backup instruments for WDXRF spectrometers used for final QC and certification.